There are two factors that force the Inner Core emitted electrons to hover at right angle to the axis of rotation while flowing on the Outer Core. The fist factor is based on the internal structure of the Earth, which like that of the other terrestrial planets, is chemically divided into layers. The Earth has an outer silicate solid Crust, under which is a highly viscous Mantle. The Earth also has a liquid Outer Core that is much less viscous than the Mantle, and a solid Inner Core. As the Earth spins about its axis, material near the planet’s Equator must travel farther to make one rotation than material near to the spin axis. Such equatorial material must then move faster than material near to the spin axis. All material has inertia; the tendency of a moving mass to continue moving in a straight line until stopped by an external force. This property makes the fast-moving material near the Equator to want to fly off from the planet in a straight line. The rest of the mass of the planet gravitationally attracts such material and keeps it glued to the planet, but the material’s inertia makes the planet to bulge out at the Equator. Every geological layer is eventually and constantly bulged. The bulge that we observe on the surface is repeated at every geological layer and in various degrees of eccentricity depending on the layer mass and distance from the centre of the Earth. As the Mantle has double the density than the Crust and has bigger volume, we expect it to be highly bulged. This allows the Outer Core, five fold denser viscous liquid, to appear oblate at higher eccentricity. In all situations the bulge major axes are aligned with the equatorial plane. Electrons emitted from the Inner Core prefers to flow along the bulged Outer Core major axes due to its low resistance liquid status as compared to Inner Mantle material. In other words electric currents hover parallel to the Equatorial Plane from the Inner Core towards the Inner Mantle. The second factor is simply the Coriolis Effect which is an inertial force that exerts on objects moving on a rotating disc or sphere and bring the trajectory at right angle to the axis of rotation. This makes all Inner Core ejected electrons to arrive at the Inner Mantle at always right angle to the axis of rotation. At high school, we studied in Electromagnetism that a charged particle that moves into a magnetic field experiences a sideways force. Such a force is proportionate to the strength of the charge, the speed of the particle, and the strength of the component of the magnetic field that is perpendicular to the path of the charged particle. Such a rule is behind the basic theory of the Motor engine and is called the Left- Hand rule. 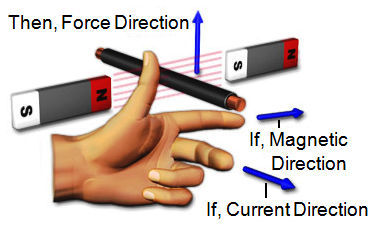 The rule states that the direction of the force, Lorentz force, is in line with the direction of the left hand thumb, so long as the direction of the magnetic field is aligned with the direction of the index finger and that the direction of the electric current is aligned with the rest of the left hand fingers as shown in the figure, all respectively perpendicular to one another. The magnetic field fluxing out of the N pole of the Inner Core towards its S pole exerts a magnetic force pointing almost toward geographic North. The negatively charged electrons flowing, in direction terms, at right angle to axis of rotation towards the Inner Mantle means, in electric notation terms, positive electric currents flowing in the opposite direction i.e towards the axis of rotation of Earth. Applying the Left-Hand rule on each two opposite sides at the shell separating the Outer Core and the Inner Mantle, demonstrates that Lorentz forces are created of pairs of equal magnitude and opposite directions. The perimeter torque of such pairs of forces keeps the spinning of the planet in counterclockwise direction, for the moment. The Earth achieves one complete spin around its axis every 86,400 seconds. One may wonder what controls the speed of the spinning? And what happens when the lines of the Inner Core magnetic field were not at a right angle with the electric current? The science of trigonometry can help answer this question. When a force is acting by an angle to the horizontal direction, it could be divided into horizontal and vertical components. 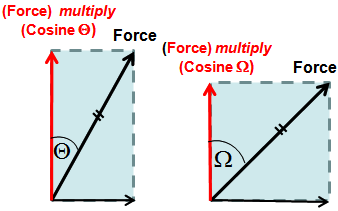 The vertical component is a fraction of the main force and is calculated by multiplying the force by the “cosine” of the angle that falls between the direction of the force and the vertical direction. You could tell from adjacent figure that when the angle is small the vertical component of the force is bigger than when the angle is large. The rotation axis of the Earth is perpendicular to the direction of Electric Current. Since the current gap angle between the magnetic force and the rotation axis is 10°, the vertical component of the magnetic force is therefore calculated by multiplying the magnetic force by cosine 10°. As the Inner Core is free to tilt, swivel and rotate, its direction with respect to the vertical direction or rotation axis may vary. The vertical component of the magnetic force will increase and decrease depending on such variations. The Lorentz force which is proportionate to the strengths of the electric current and the vertical component of the magnetic force will accordingly vary. The lesser the force, the lesser the torque forces that rotate the planet, and accordingly the slower the planet will spin. The rate of Earth’s spinning both increases and decreases across rather lengthy stretches of time. Spinning observations are tabled over 374 years (from the year 1623 to 1997) . Throughout the many years, it is apparent that the length of the solar-day was a fraction of a second faster than 86,400 seconds about 41 percent of the time. It is equally apparent that the length of the solar-day was a fraction of a second slower than 86,400 seconds about 59 percent of the time. Unlike what is currently believed in most text books, and based Earth Magnets, I deduced that the magnetic field that we observe and measure on the surface of the planet is emanating from the Inner and not the Outer Core. It is also deduced that the electrons emitting from the Inner Core that are flowing through the Outer Core, create electric currents that are at right angle to axis of rotation or in other words parallel to the equatorial plane. Such electric currents interact with the magnetic field’ components that are perpendicular to its direction to generate driving forces that form pairs of torque to keep the planet spinning about its axis. But, what if another celestial body that possesses a strong magnetism comes in close vicinity to the magnetically balanced solar system? The dipole magnet of the Inner Core of the Earth is thus subjected to a new and additional magnetic force emerging from such intruding planet. The Inner Core dipole magnet will be influenced by the intruding magnetic field force lines and the Inner Core may tilt, causing increase in shock waves and Earthquakes. The spinning of the Earth will be impacted when the Inner Core starts to tilt and the gap angle changes. If the gap angle between the axis of Earth rotation and the magnetic axis gets larger, the Earth rotation slows down and the hours per day will vary. The Lorentz force would die out when the gap angle reaches a 90o and the Earth will cease to spin about its axis. If the gap angle becomes obtuse, the planet could start to spin in the opposite direction, i.e. clockwise. The Earth’s axis of spinning is always perpendicular to the electric current flows. Most planets in our solar system, including Earth, spin in the same direction as they orbit the Sun. As we explore historical and holy citations on the pages of this site, we shall be able to establish the time at which events of tilting of the Inner Core took place at times and we could then deduce a cycle of repetition. Most Scientists are obsessed with planets whose magnetic field is induced by electrons flowing in its outer core. They claim that Earth magnetic field is induced. But, there is another view as explained above. They claim the same for Saturn where its inner core is surrounded by an outer core of thick liquid metallic hydrogen and that emitted electrons from its inner core induce the magnetic field that we observe for Saturn. They are surprised to have found that a magnetic field for Mercury does exist although Mercury does not have a liquid outer core which, according to them, is mandatory for electrons to flow into and induce a magnetic field. I come with a simple design for all the planets. If magnetic pole is wandering and does not settle nor align itself with the rotation axis, then such a magnetic field must result out of a true permanent and not electrically induced magnet. If it were an induced magnet from electric currents flowing at right angle to axis of rotation according to the Coriolis effect, then the magnetic force lines would be parallel with the rotation axis, let alone of similar polarity (south magnetic polarity when the spin of the planet is anti-clockwise and north magnetic polarity if the spin of the planet is clockwise) at both north and south geographies . The strength of the electrons flowing from its Inner Core. It is a constant flow over a period of time and can only deplete over millions or billions of years. The strength of the magnetic field. It is also almost always a constant force. The angle between the Magnetic axis and the Rotation axis. Such a gap angle is a variable and could get easily changed by the pull of an outsider magnet/ planet. Rotation axis will remain unchanged, but Magnetic axis may. If the gap angle gets smaller, the planet spins faster. If the angle gets larger, the planet spins slower (as you could tell for Saturn and Venus for instance). If such an angle reached 90 degrees, the planet stops spinning; as it did for Earth several times in the past as per ancient text which we shall read about later. The strength of the electrons flowing from its inner core is constant and can only deplete over millions of billions of years. The strength of the magnetic field is almost always constant. The angle between the Magnetic axis and the Rotation axis is constant and does not get changed by the pull of an outsider magnet/ planet. If the magnetic force of such an intruding planet is strong enough, Mercury Rotation axis may very well start tilting driven by the tilt of its Core. You may wonder what was the spin speed of Earth 500 million years ago when Earth was younger and the strength of the electrons flowing from its Inner Core was more abundant than today. You would expect the Lorentz force to be stronger, and you are right. Keeping angle between the Magnetic axis and the Rotation axis, as in today’s case; Earth’s day 500 million years ago was 18 hours/ day according to Geologists. The intruding planet must own a very strong magnetic field to influence the tilt of the inner cores of many of the planets of the solar system. But, it has not been detected by NASA as yet.